We all have that one friend — the overachiever who awakens before sunrise every Saturday, blissfully hangover-free, and posts a sweaty selfie from the finish line of some charity 5K, complete with a shiny medal, all before the rest of us even open our eyes. If all that action sounds like your idea of a waking nightmare, we have the race for you: the Cow Key Channel Zero K Bridge Run, the world’s only 0K race. Like most fantastically silly ideas, the inspiration behind the Cow Key Channel Bridge Run was sparked by a less-than-sober night out. While having a drink or three one humid July night, David L. Sloan, author of “Quit Your Job & Move to Key West” and “Roosters Are A**holes” and quite possibly the only person who has ever written an ode to an abandoned mattress, found himself agreeing to run the Hemingway 5K the next morning with his admittedly more athletic friend. The Hemingway race, conceived in conjunction with the notoriously boozy author’s birthday, famously leads runners toward a finish line of free beer by way of Hemingway’s favorite downtown haunts. Sloan made his way through the race with what he describes as disastrous results, while his friend attempted to goad him into signing up for an even longer one. Then he teamed up with local artist and event coordinator Marky Pierson and personal trainer and general community activist Liz Love to produce the event. “The the rest, as they say, is history,” he says. 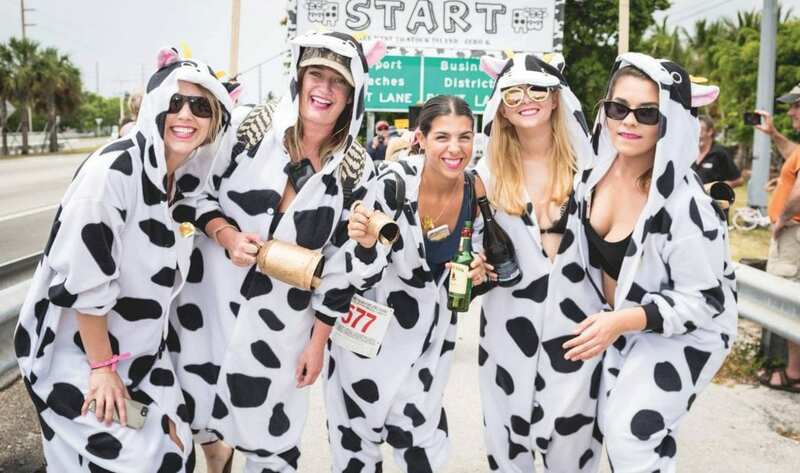 On an island where quirky costumes are practically daily wear and 5K races are about as common as iguanas, the Cow Key Channel Bridge Run satisfies on multiple counts. First, the race is mercifully short and bookended with parties, a set-up guaranteed to attract a strong percentage of local participation. Second, its costume requirements are of the least restrictive kind: an annual cow-related theme offers maximalists the opportunity to go buck wild, while last-minute procrastinators can just slap on a few black spots, throw a bell around their neck and call it a day. Third, it’s simultaneously cheap and generous. Registration runs a mere $10, with a portion of the proceeds going to the beloved Monroe County Sheriff’s Animal Farm. 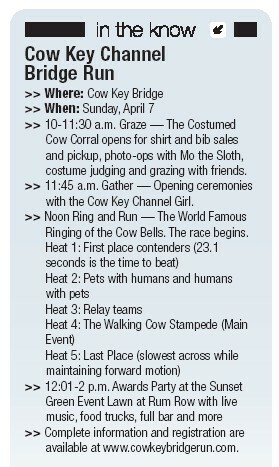 (The farm’s most famous resident, Mo the Sloth, is an absurdly appropriate mascot for the Cow Key Bridge Run and attends each year.) Upgrade your registration to $35 and you’ll walk away with a Tshirt, a 0.0K sticker and a koozie. And finally, it’s an opportunity to win prizes across an eclectic yet accessible spectrum of categories that require little to no athletic ability, including First Place (if you’re planning on racing in the traditional sense, 23.1 seconds is apparently the record to beat), the Acowdemy Award for best theatrical performance on the bridge and a Last Place award for slowest across the finish line while still maintaining forward motion. This year, the organizers have added the Golden Cow Patty Award for the person who puts the least amount of effort into his or her costume. 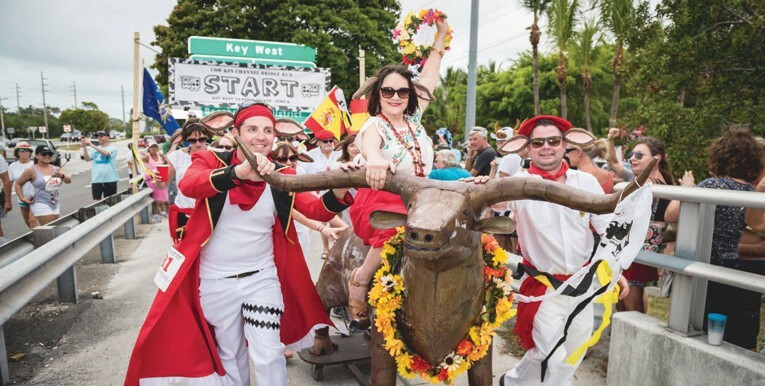 If there’s one thing Key West locals love above all else, it’s the ability to win prizes while drinking in costume (or pajamas, if you’re vying for that Golden Cow Patty). Add in a random sloth, and you’ve got the perfect Key West event. This year’s race — the event’s sixth — falls on Sunday, April 7. The theme, “Pirates of the Cowibbean,” was suggested to Sloan by a mystery participant after last year’s event. Beginning as early as 10 a.m., participants can park for free at the nearby Marriott Beachside Hotel and make their way to the grassy area on the Key West side of the Cow Key Channel Bridge, which connects Key West’s main island to Stock Island. Here they are invited to “graze” in the Costumed Cow Corral, inside of which newcomers can register and purchase swag, and where previously registered runners pick up their bibs and T-shirts. Mo the Sloth will be on hand for photo ops, and costume judging will take place until 11:45 a.m. at which point the race’s opening ceremonies, led by Cow Key Channel Girl, take place. After the actual runners have crossed, the Pets with Humans heat will commence, followed by relay teams, the Walking Cow Stampede and the coveted Last Place heat. Sixty seconds after the official start, the after party will kick off at the Sunset Green Event Lawn across the bridge at The Gates and 24 North Hotel properties. 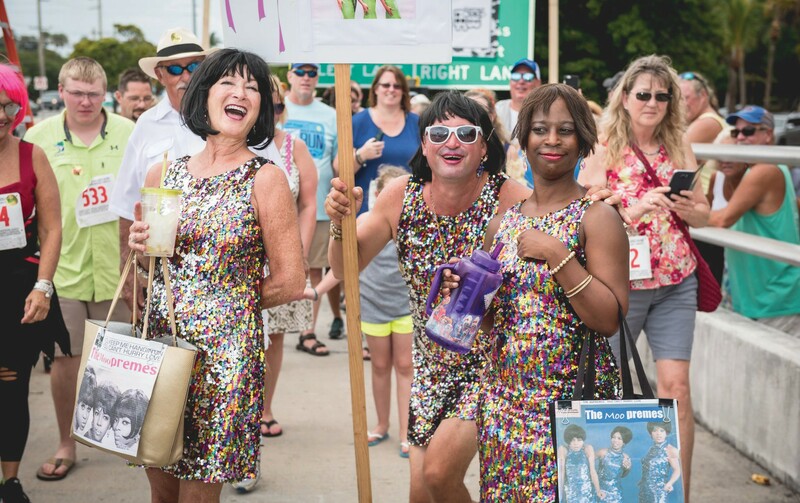 In addition to announcing award winners, the party will have live music, a full bar, food trucks, door prizes, wine tastings and a suggestion box for next year’s race theme. Cower Power? Cowpocalypse Now? I digress. The event has grown since its inception, with each year bringing new participants. Sloan doesn’t want to tease too many of the special guests (keep your eyes peeled for a giant manatee), but he’s especially excited about a very special runner joining the fun this year. If you’re still on the fence about participating in this low-effort, low-stress event, consider that it might not have a home next year. “We may have started as a joke, but it’s sad to consider that this year’s race could be the last one for a year or two because of the construction coming up on the Cow Key Channel Bridge,” Sloan says. “We don’t want to block any traffic anywhere in town while construction is ongoing, so we probably won’t be able to have a race. Newcomers are advised to bring water, sunblock, a cow bell and a camera; though the race is only 300 feet or so, there is little to no shade available during the first two hours inside the corral, though the nearby Marriott does offer a pool bar at which bovine and humanoid guests can purchase pre-race refreshments. The event is also completely pet friendly, from pre-race festivities to the after party at Sunset Green. To Sloan, the Cow Key Channel Bridge Run has become much more than a silly thing to do on a Sunday afternoon. On a final note, he emphasizes the charitable aspect of the run.